My last post was all about my visit to Hartnett Holder & Co Backstage on their Season Entertaining cookery course. The course was absolutely fantastic and I would thoroughly recommend it to anyone who enjoys cooking and wants to learn something new. Among other things, I learned how to make pasta from scratch, fillet sea bream and prep a live lobster. Hartnett Holder & Co Backstage, or HH&Co Backstage, is a brand new cookery school set in the stunning Limewood Country House Hotel located in the heart of the New Forest. Led by well-known chefs Angela Hartnett, Luke Holder and Iain Longhorn, the style of learning at HH&Co is fun, relaxed and hands on. "It's more like being behind the scenes in the kitchen of the HH&Co restaurant rather than a school, so we call it backstage" explains Chef Iain. Rather than gas, induction is the choice of hob for the chefs at HH&Co for the resturant kitchens as well as the cookery school, specifically Panasonic. As well as the performance and technology, the chefs wanted subtle, simple and clean looking built-in appliances which would blend in with the rustic look, without compromising on functionality. "We aim to wow guests with simple and consistent cooking" says Chef Luke. "With Panasonic induction hobs, we can help visitors to cook things they never thought they could cook – like braised beef cheeks and truffle baked bream – as they are so easy to use, and the results are the same every time. We want visitors to challenge their cookery skills and achieve restaurant-style dishes at home, which is why we wanted them to be able to do it on the best appliances." "I love cooking on these hobs" says Chef Iain. "They heat up quickly, they cool down quickly, and there's no heat lost to the air, so the kitchen stays nice and cool." He put his hand on the hob which he had turned off minutes before. "It's still warm, but I can touch it without getting burned. "Induction hobs cool down far more quickly than a gas hobs, so they are much safer as well." I have only cooked on an induction hob twice - the second time was at HH&Co. I was expecting them to be similar to an electric hob but they are just as responsive as gas. They did take a bit of getting used to, but once I got the hang of it, they are very easy to use. With my own limited experienced of induction cooking, I was keen to do a bit of research to find out what makes induction hobs so brilliant, and more importantly, the science behind it all. We currently have a gas hob in our house which we moved into 9 months ago, but we're getting ready to change the kitchen soon, and I'm wondering if we should switch to induction. Induction hobs are generally more expensive than gas to buy, I don't mind investing in one, as long as it's worthwhile. The picture below left illustrates how induction works. Magnetic field lines are created by electricity passing through the coil located under the top of the hob. 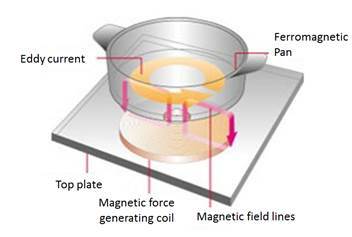 Eddy current is induced in the pan base when the magnetic field lines pass through it (hence you need a magnetic pan). Heat is generated in the pan by electrical resistance in the pan base and the pan base is heated. So, because the pan base creates the magnetic field almost all of the energy (around 90%) is transferred into the pan. With gas, around 40% of the energy goes into the pan, so up to 60% is wasted. As you can see in this video and the image above right, the only area of the hob which gets hot is the part the pan is on - the surrounding area stays completely cool. The other benefit is that the kitchen will stay cool. No more 'slaving over a hot stove' as they say. Because of the way induction works, it is far more efficient than gas or conventional electric, so much quicker. According to internal tests, a Panasonic induction hob can bring a pan of water to the boil twice as fast as gas and three times more quicker than an electric hob. Panasonic induction hobs also feature an Autoboil function which brings water to the boil with one touch. The Genius Sensor, patented by Panasonic, assures precise temperature control - even if the temperature suddenly lowers when food is turned over or ingredients are added, it rapidly returns to the set temperature. There's also 5 preset temperatures for pan frying ranging from 140-230°C. Some models of Panasonic induction hobs also have the Genuis Sensor Plus which keeps the pan at a constant low temperature, 65-120°C, ideal for stews and curries. Panasonic induction hobs also have functions to keep food warm using a pause button and timer controls which switch off the hob if you wish. I've mentioned the Autoboil function above, which brings water to the boil with one touch. I can't help but get a little excited at the thought of having all these functions to hand. They just make life a bit easier, which would give me one less thing to think about and save me from running back and forth to the kitchen. Because the heat source is effectively in the pan and not in the hob, induction hobs cool down really quickly, so there's far less chance of getting burns. Panasonic induction hobs also have a Child Lock, which disables the control panel and also an Automatic Shut Off feature. The Control Panel Lock feature disables the control panel for 20 seconds to allow for cleaning spills quickly without affecting the settings. This is an obvious one, but there's no chance of kids accidentally switching gas on with induction. I'm always a bit nervous about that. I've turned on the gas lots of times just by leaning on the knobs by mistake, because they are at a 45 degree angle to the worktop. Induction hobs are very easy to clean as they are essentially a sheet of glass - unlike gas hobs which have so many bits to take apart, clean and re-assemble. My gas hob is permanently filthy because I cook so much and I don't have time to take it apart and clean it every day. Induction hobs are neat, subtle and un-imposing, so perfect for any style of kitchen. They would obviously suit a very modern kitchen, but they equally looked great in the rustic style kitchens of HH&Co. I have to say something about the cost of running an inducton hob compared with running a gas hob. I have literally scoured the internet looking for articles about this, but there's nothing I can find which simply compares one to the other. Its a tricky thing to do as they are measured in different units. However, what I have found from reading many articles and forums (some are here, here and here) is that people who have switched from gas to induction say that have not noticed an increase in their fuel bills. I have found one article which calculates that cooking with gas costs 64.7% more than cooking with induction, but this is the only article I found which gives actual any figures. However, with fuel prices differing from area to area in the UK it's tricky to say how accurate this is. You need magnetic pans for an induction hob. Go through your pan collection with a fridge magnet to determine which ones you will need to replace. You don't have to spend lots on new pans, many inexpensive pans are ferrous and can be used on induction. You need to use flat pans on an induction hob, so no woks! You can however buy a wok with a flat bottom, if you're happy to compromise. Or you can buy a very expensive bendy wok induction hob. Just something small but something I would probably overlook. If you have a gas hob, you will need to shut off the gas supply and make sure you have an electricity point (or get it routed) if you are installing an induction hob. So you may need to get someone in to do that. Just something small, but needs to be thought about.